‘Game Night’ is the latest comedy from the screenwriters behind ‘Horrible Bosses’ and it centres on a group of friends who become caught up in a criminal conspiracy as a result of a ‘game night’ prank gone wrong. The film focuses on Max (Jason Bateman) and Annie (Rachel McAdams), an ultra competitive couple who hold weekly game nights with their friends, essentially an opportunity for Max to show off his knowledge on a variety of subjects. These cosy nights are interrupted by the arrival of Max’s better looking, more successful (in life and at games) brother Brooks (Kyle Chandler), who is back in town for a short while and wants to add a bit of excitement to the nights. His way of ramping things up a notch begins gently by introducing drinking games to the relatively tame gatherings, before going even further and hiring a company to kidnap one of the group. This plan goes awry when a real kidnapping occurs at the same time, unbeknownst to most of the group members. 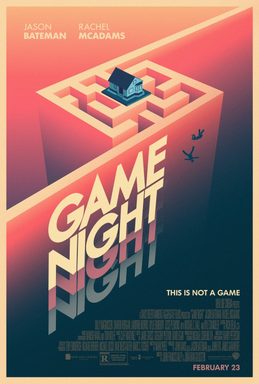 The early parts of ‘Game Night’ are great fun as the filmmakers play around with the script, committing to an approach that uses the element of surprise to keep the plot ticking over nicely and prevents the audience getting too comfortable. I liked most of the characters, enjoyed most of the pop culture references (some funnier than others) and I felt the film got the balance between slapstick comedy and violence mostly spot on. In terms of the performances, the game cast fit their archetypal roles well (if not exactly stretching their abilities much), with Jesse Plemons a standout as a divorced neighbour who no longer gets invited to the game nights. It does start to run out of steam towards the end with a few too many fake outs and a move towards ridiculous and over the top action scenes that feel tonally distant from the small scale anarchy of the beginning, but I did enjoy the film overall. I thought ‘Game Night’ was a sharply written comedy that makes the most of its premise and its talented cast and even though it loses its way a little towards the end, I thought it was worth its 100 minute runtime.